The government authority that provides hearing devices is rationing access to technology upgrades because its budget cannot meet unprecedented demand for the latest speech processor. Harry has just brought home his new N6 processors but not as a result of his Australian Hearing upgrade he should have been eligible for after his N5 processors went out of warranty this month. Australian Hearing used to provide every child with Cochlear Implants in Australia under 26 yrs a new processor after the processor was 3 years old. This was the period of warranty given by Cochlear Ltd and therefore the Federal Government through their agency Australian Hearing created a policy to ensure each child user had a processor under warranty. It seems that the increase in technology from the N5 to the N6 was so great that everyone wanted the new processor. Probably the wireless capabilities in the N6 and the new SCAN program( an automatic monitoring of background noise) were features that made it worthwhile to request an upgrade. Many families were waiting patiently to get their new processors while Australian Hearing was working out how to get around the lack of funds to give everyone out of warranty or who had broken their old processor beyond repair, the new N6. The policy was revealed a fortnight ago and made retrospective, declaring only children under 5 and between 25-26 yrs are now eligible to receive the upgrade after 3 years. Users outside this age group have to apply through their personal private health cover for the new processors. 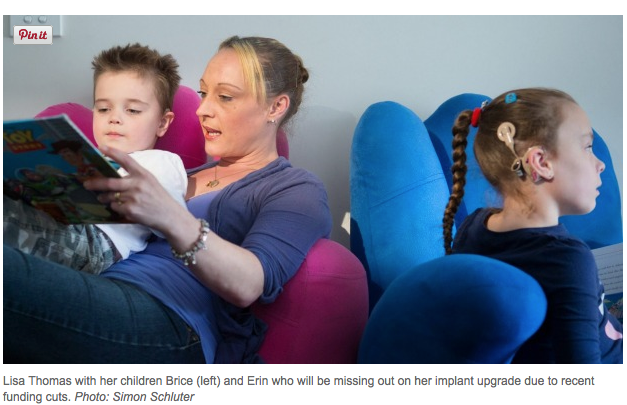 This is not possible for a majority of families with children who are deaf and require cochlear implants. I understand a group of parents has started lobbying the Govt to reassess the policy and I urge you to contact your Local Govt to do the same. The more voices, the more chance of change. At least the kids going to school should be covered as the new technology used everyday in schools means the old processors will be outdated before too long and those kids will miss out on vital learning. If you require more information on your child’s eligibility please contact your local cochlear service centre or CIC.